We're excited to have Catherine Egan stop by to tell us about her latest novel JULIA VANISHES. Catherine, what scene was really hard for you to write and why, and is that the one of which you are most proud? Or is there another scene you particularly love? The scenes I find the hardest are the ones that involve a lot of characters. I would be a terrible theater director – blocking is my nightmare. I really struggled with the scene where Mrs. Och’s whole crew comes to meet with Esme’s whole crew (including Julia) in Liddy’s shop. Pretty much every major character is there in the room, and it’s an incredibly fraught point in the story, so I want to give a sense of everybody’s emotional state, their responses to what is happening and the revelations unfolding, while also keeping up the pace. In an outline of the chapter, I listed where everybody was standing, their reactions, what they said, and so on, but trying to write the scene involving everyone and maintaining the tension and pacing was difficult. Transitions in the action are tricky too; I had to rewrite the journey from Spira City to Nago island many times before I felt like I had it right. The parts of the book I like best tend to be the same parts that came very easily when I was writing. I don’t know that I could name one particular favorite scene – though I do like Julia’s confrontation with the Gethin, her first meeting with Pia where she’s sinking into the sofa cushions and Pia is eating a mango and scaring the crap out of her, or the horrible Cleansing Julia goes to see with the housemaids. Mostly I’m happiest writing scenes in which Julia is having some kind of intense interaction with one other character. I’m at my most confident as a writer there, where two characters have to talk to each other and emotions are running high. How long did you work on JULIA VANISHES? This is a trickier question than you might expect! I started writing it years ago, during my toddler’s one-hour afternoon naps, while I was pregnant with my second child. How much time I could scrape together to write was constantly changing as my kids changed their routines. For years I worked on it in bursts and then put it aside to simmer while I worked on other things. Being able to measure my writing time in hours or days is a relatively new development – for so long it was half an hour here, fifteen minutes there. But I tried to do the math, and I think I spent somewhere in the range of 35,000 to 40,000 minutes working on JULIA VANISHES. This is the book where I really learned how to revise my work. I mean, I’d always revised stuff, but never as thoroughly as this. And I owe that lesson very much to my agent, Steve Malk, who wanted a bunch of revisions before he felt it was ready to send out to editors (and he was right). I learned the tremendous value of having good editors to push me, and I think I got better at stepping back from my work, trying to look at it like a puzzle I need to rearrange to form a clearer picture, or being able to pull back to see big picture and then zoom in to see pieces, and switch from one to the other. The road was long and naturally paved with rejection but it was a relatively happy road too. There were enough small successes along the way to keep me from getting discouraged, and I was always working on something new and fun by the time a rejection rolled in. In fact, my only piece of advice for anyone trying to publish a book (or a short story or a poem or anything) is to get yourself deep into a new project, completely in love with it, before you send out the finished stuff. That way, when rejection comes, you might be disappointed, but in your heart you’ll feel that the current project is the really special one and will surely have better luck. You can carry on that way quite happily for decades – believe me. I wrote short stories for years and published a number of those in journals, while others were never published. I sent out a short story “collection” to a bunch of small presses, and the general response was “good – not good enough – write a novel.” So I wrote a novel. At this point I was writing for an adult audience. In retrospect I can see that the novel was a spectacular failure, but it had some good bits in it – enough good bits that I had some nice and encouraging exchanges with editors who said “no thank you but send something else” – and that’s always nicer to hear than just no. I had a particularly long and helpful exchange with Geoffrey Ursell, the publisher at Coteau Books, a small indie press in Saskatchewan that had published some books I loved. When I told him that I was taking a break from my adult novel to write a children’s book, he told me to send it to him when I was done. I did, and Coteau Books published my first fantasy trilogy, The Last Days of Tian Di. That was a lovely experience, and any anxiety about publication was mitigated by the fact that I was deep deep deep in writing about Julia by the time those books were coming out. I sent Julia Vanishes out to a few agents, and luckily for me, Steve Malk saw some potential in it. I spent about a year revising it with Steve – he would send very detailed notes, I would rewrite the book and send it back to him, and he would send more notes. I learned so much about revising my work during that year and once we both felt it was truly done, he sent it out and it sold very quickly. When my children were very small, I wrote whenever and however I could, even if I only had fifteen or twenty minutes, and I needed to write so badly that it kind of worked. I mean, it felt very desperate and I felt guilty about it too because there was always something else I ought to have been doing, but looking back on those chaotic years I’m amazed at how much I actually produced. Now my kids are older and I write when my younger son is at preschool – three hours in the morning. I take the kids to school and the walk back home by myself is when I clear my mind and start thinking about the story. I make a big mug of coffee, get myself a slab of dark chocolate, open the computer, and that’s how I begin. Oh, and SILENCE if I can possibly have it! However, I am well trained in tuning out noise if I need to, and I have my kids to thank for that. On weekends I write at a nearby café, and again the ritual is walk & think, get coffee, get chocolate, work. It makes me incredibly happy. I’m still deep in Julia’s world, working on the sequels. We are working on edits of book 2 and I’m revising my draft of book 3 (which nobody else has seen yet!). I also have an ever-growing file of notes, and sometimes I sneak away from Julia for a bit to spend some time with this New Idea and some New Characters that are whispering to me all the time and waiting restlessly in the wings. Then Julia yanks me back because she has a wall to scale or a letter to steal or a boy to smooch and she can’t do any of that without me. Julia has the unusual ability to be…unseen. Not invisible, exactly. Just beyond most people’s senses. It’s a dangerous trait in a city that has banned all forms of magic and drowns witches in public Cleansings. But it’s a useful trait for a thief and a spy. And Julia has learned—crime pays. Her latest job is paying very well indeed. Julia is posing as a housemaid in the grand house of Mrs. Och, where an odd assortment of characters live and work: A disgraced professor who sends her to fetch parcels containing bullets, spiders, and poison. An aristocratic houseguest who is locked in the basement each night. And a mysterious young woman who is clearly in hiding—though from what or whom? Worse, Julia suspects that there’s a connection between these people and the killer leaving a trail of bodies across the frozen city. The more she learns, the more she wants to be done with this unnatural job. To go back to the safety of her friends and fellow thieves. But Julia is entangled in a struggle between forces more powerful than she’d ever imagined. Escape will come at a terrible price. CATHERINE EGAN grew up in Vancouver, Canada. Since then, she has lived in Tokyo, Kyoto and Beijing; on a volcanic island in Japan (which erupted while she was there and sent her hurtling straight into the arms of her now husband); on an oil rig in the middle of Bohai Bay; in New Jersey; and now in New Haven, Connecticut. She is currently occupied with writing books and fighting dragon armies with her warrior children. You can read more about her at www.catherineegan.com. 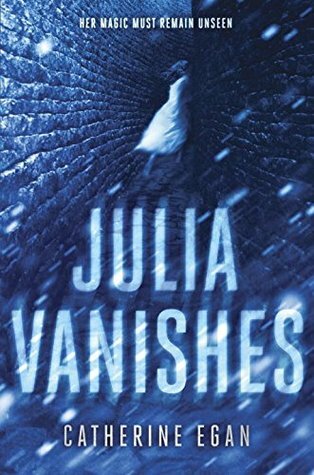 Have you had a chance to read JULIA VANISHES yet? Are you able to pull back to see the big picture and then zoom in to see the pieces when you revise? Do you get yourself deep into a new project before you send out finished stuff? Share your thoughts about the interview in the comments!